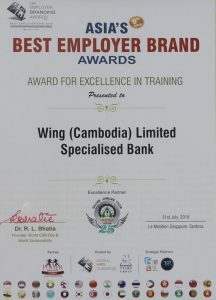 Phnom Penh – August 08, 2018: Wing (Cambodia) Limited Specialised Bank once again proves to be the leader in human development on the recent 9th “Asia Best Employer Brand Awards” held in Singapore on July 31, 2018. The bank has been awarded not only one but two outstanding awards, “Best Employer Brand Award” and “Excellence in Training Award”. 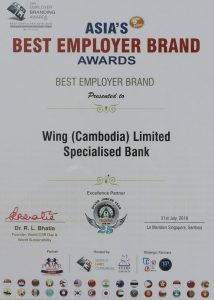 The two awards recognize Wing for its persistent efforts and commitment in the development of its employees as well as human resource policies and strategies that nurture and develop their talents. 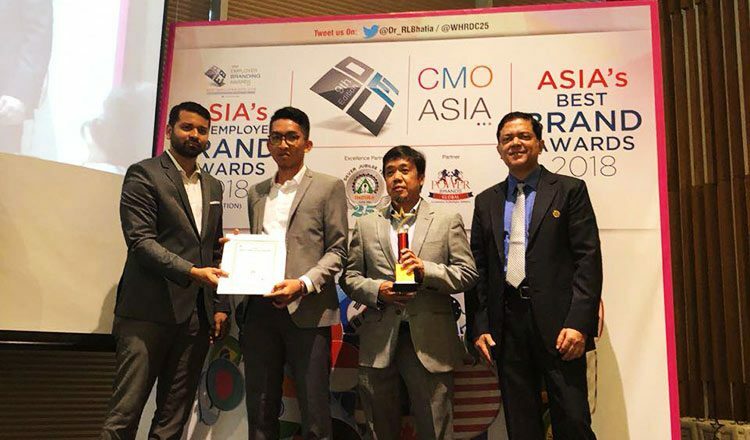 Attending the awarding ceremony, Wing Chief Executive Officer, Mr. Jojo Malolos said the company puts its focus on employee improvement through ongoing training to the company’s staff with the aim of building best-in-class employee experiences through qualified people management practices. 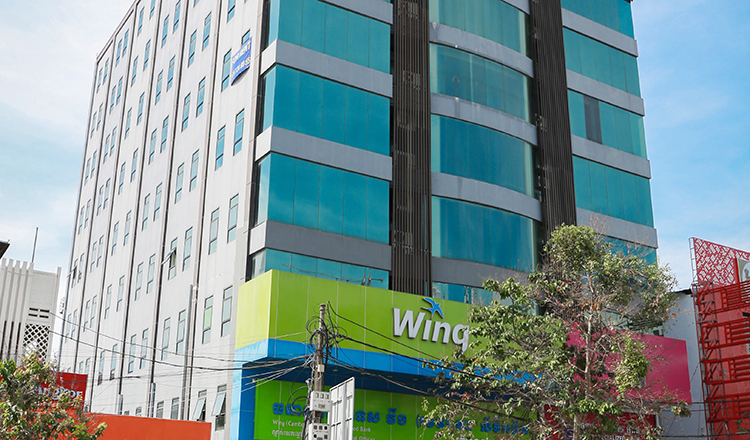 “Wing sees its employees as being key to delivering the company’s vision of providing every Cambodian with convenient access to mobile financial services for the improvement of their daily lives,” Mr. Malolos said. In addition to outstanding training programs such as Employee Passport Program and Manager Passport Program, Wing also commits to creating a fun and engaging workplace where employees can build team spirit and contribute back to their communities. 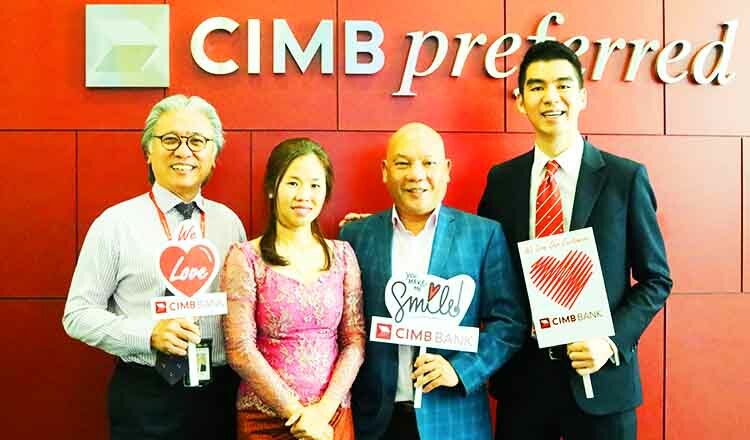 Such activities include employee football tournament, Khmer New Year celebration, and CSR projects at rural communities through house building, digging wells, donating funds to children hospital, and so much more. 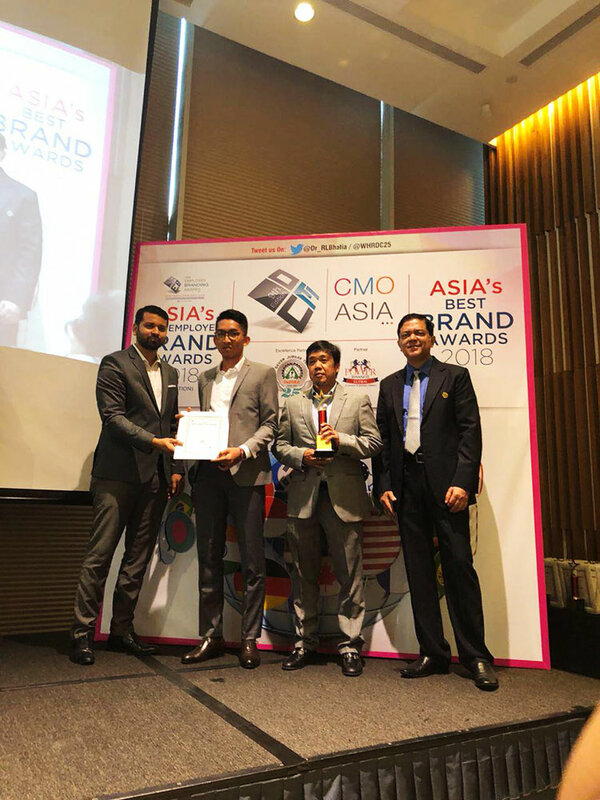 This year marks the third consecutive year of Wing winning The Best Employer Award from Asia’s Best Employer Brand Awards. 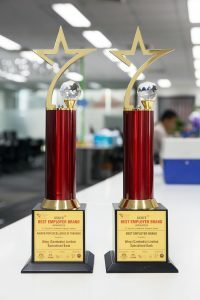 The 9th Asia’s Best Employer Brand Awards are hosted by Employer Branding Institute; World HRD Congress and Stars of the Industry Groups with the aim of awarding businesses in several geographical regions who are contributing to Talent Management, Talent Development and Talent Innovation”. CEO of the Year in the Insurance Category. Manulife Cambodia CEO and General Manager Robert Elliott.